Clockhouse Primary School Council has evolved into a School Parliament. Here a group of pupils are elected by their peers to represent the views of all pupils and to improve their school. From this parliament a ‘cabinet’ will be elected. Some of these children hold titles such as Shadow Head Teacher, Shadow Deputy Head, Shadow Chair of Governors etc. The School Parliament meets, once every half-term, to discuss and sort out problems. These may include school lunches, behaviour or ideas for fundraising events. Members of the School Parliament will be responsible for carrying out the ideas that have been agreed, such as: what to spend fund raising money on; improving Reward Time across the school or planning new playground activities. Being a school parliamentarian is a really responsible job and as Clockhouse Primary School Parliament is evolving to be a very effective one, it does mean that every child learns a lot from taking part. We want our school to be the kind of school that everyone enjoys coming to, where everyone knows and understands each other. We want it to be a cheerful place, where we look after everyone. We want it to be a safe place where children can be trusted to be sensible, because everyone follows the class and school rules and expectations and lives by the school values. We want everyone to be honest, have good manners and to treat people and possessions with respect. We want to be proud of our work and try our best every day, so we do well with our learning and are the best that we can be. We will keep going when things are challenging and listen carefully to each other. We want to find out interesting and useful things about the world. If everyone can do this we will remember the great time we had at Clockhouse, with our friends, for the rest of our lives. What is our School Parliament for? How does our Class Parliament work? 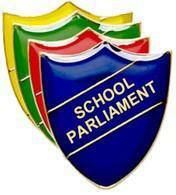 What will the School Parliament do for our class? If they cannot make the idea happen there will be clear reasons why this cannot happen. If they can make your idea happen they will need your help to make it happen. What will staff do for the School Parliament?